If you are a Seafarer professional looking for a new job, these are the jobs available in the marine industry. V.Group is providing people with more opportunities than ever before. Since 2010, V.Ships – the group’s primary brand – has given promotions to over 3,900 officers, with an extra 2,200 more people onboard their vessels. But the world’s largest ship management company is not just creating jobs for seafarers. With an array of careers reflecting the scope of the services provided to their shipping, maritime leisure and energy clients, now’s your chance to join over 40,000 contract staff, as well as around 2,500 shore-based staff, now is the time to embark on a career for life with them. For further information on the company, including its primary brand V.Ships and other core services, visit vgrouplimited.com, vships.com or vshipsleisure.com. For those who are interested in applying for the job, go to this link now www.seamanjobsite.com. Posted in Seafarer Blog and tagged Career As Seafarer, Loan Star Lending Group Corporation, manning agency, seafarer job, seafarer job available, seafarer job opportunity, Seafarer loan, seaman loan. Awesome tip for Seafarers who are looking for a work at sea. Keep it up! 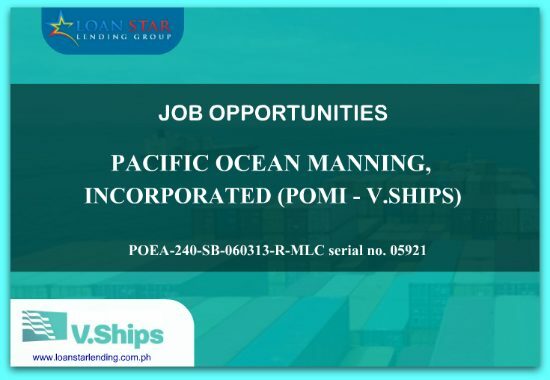 Seafarer Job Opportunities – BSM CREW SERVICE CENTRE PHILIPPINES, INC.